Well the winter roll-a-coaster has taken us to February. The picture below mirrors the winter – some places frozen, some places thawed. While the pond is still frozen solid, the lawn in front of the nature center has only a trace of snow, due to a couple of bright sunny days. The next series of pictures are of some animal tracks found seen around the nature center pictured above. This coyote had wandered all over the place- up and down the driveway, across the pond, through the boardwalk area- no doubt looking for a tasty rodent or whatever else it could find. The ground around the nature center is peppered with all manner of little bird tracks. I don’t know if the picture above does it justice, but it looks like a birdie stampede in all directions! The curious tracks below were seen in front of the nature center. These were a real mystery at first. They were fairly close to the edge of the pond, so I thought…muskrat tail? But that does not work as the pond is completely frozen. As I searched a little more, I found the track pictured below. Ah ha! What I was seeing was a partial track that was created by the snow, thaw, snow that’s been going on lately. I believe that mystery tracks are those of a white-tailed deer. 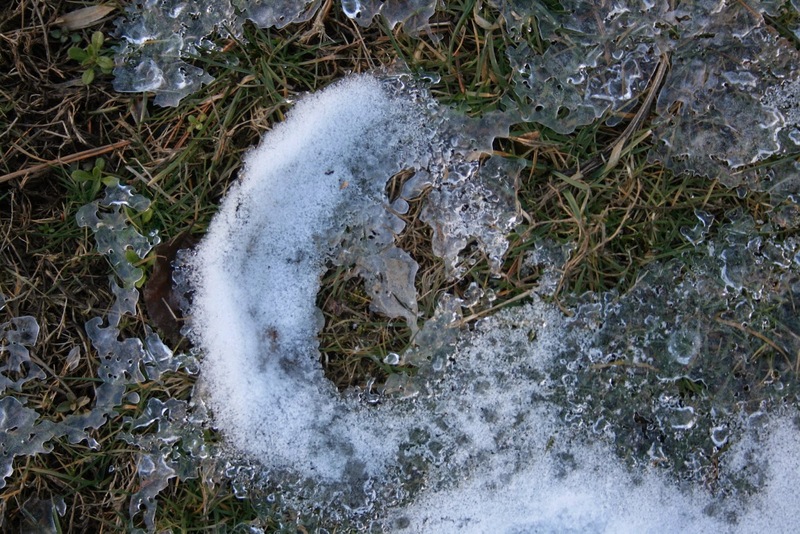 Old tracks that had partial melted were later cover by new snow, thus creating the crescent shaped mystery tracks. I am remained of an old TV commercial that said, ” You can’t fool Mother Nature”. By sometimes Mother Nature can sure fool you! !